Number of dolls: 5 Artist: Ivanova School: Simbirsk Size: 4'' This hand crafted and painted set of Matreshka dolls was created especially for Russian Treasure ..
Name: Children's Fairyland Number of dolls: 5 Artist: Ulyukova School: Simbirsk Size: 8'' A delightful design of these Matryoshka nesting dolls is a unique contribution to..
School: Fedoskino Artist: Dobronogova T. Size (inches): Inquire. 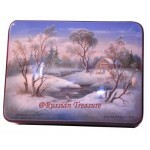 This classical lacquer box named “Gossiping” was designed, hand-crafted and hand-painted in the famous Fedoskino village, .. Number of dolls: 5 Artist: Sukhovej O. 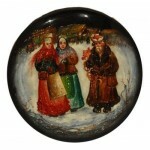 School: Simbirsk Size: 6’’ It doesn’t matter whether you’re spiritual or atheist, these Russian Matryoshka Nesting Dolls will certainly d..
School: Fedoskino Artist: Platonov Size (inches): 5 inches diameter A unique example of Fedoskino lacquer miniature painting, this antique lacquer box revives the old traditi.. 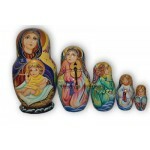 Number of dolls: 5 Artist: Ryazanova N School: Obramtsevo Size: 6.5'' This museum quality set of Matryoshka nesting dolls is hand crafted and painted by a famous Russian artis.. 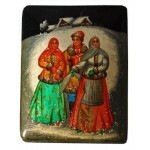 Number of Eggs: 3 Artist: Ivanova Size: 3 inches Style: Oil painting, watercolor, exceptional lacquer finish This set of Matreshka Nesting Eggs was designed, hand-carved, han.. 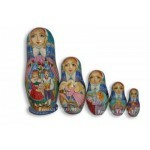 Number of dolls: 5 Artist: Muravjeva E. School: Simbirsk Size: 6'' This set of Russian Matryoshka nesting dolls features one of the most popular Russian motives – winter. .. Artist: Muravjeva Size: 7 inches Style: Watercolor and Oil painting, Fairytales A tantalizing story with the most favorite Christmas and New Year motive featured in this set of M..
Name: Angels Number of dolls: 5 Artist: Sukhovey O. 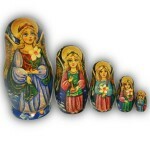 School: Simbirsk Size: 6.5'' This tender and touching Russian Matryoshka Nesting Dolls set fills your heart with love and.. 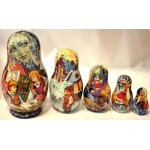 Number of dolls: 5 Artist: Yatmanova G. School: Simbirsk Size: 6'' A true masterpiece of Russian artwork, this set of Matryoshka nesting dolls tells a fabulous story about the Nutcracker,.. 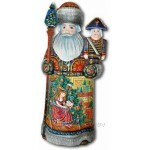 Number of dolls: 1 Artist: Krylov S. School: Simbirsk Size: 12 inches The wooden Santa Claus has been designed, hand carved and painted by a famous artist who also specializes.. 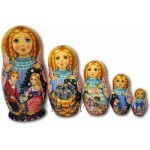 Number of dolls: 5 Artist: Muravjova School: Simbirsk Size: 8'' These wonderful decorative Russian Matryoshka Dolls depict one of the most popular Russian folk tales - "Sneguroch.. 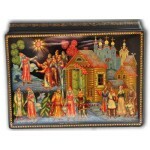 Number of dolls: 5 Artist: Sidorova School: Simbirsk Size: 8'' This museum quality set of Matrushka dolls features one of the most favorite winter fairytales, the Snow Queen. .. 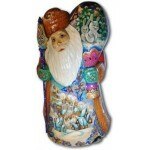 Number of dolls: 1 Artist: Ilukova School: Simbirsk Size: 14 inches This beautifully carved wooden Santa Claus will make one’s winter holidays even more colorful and joyful. ..
School: Fedoskino Artist: Serdotetskov V. A. 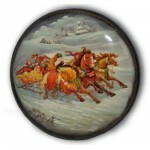 Size (inches): 5x3.5x1.75 Serotetskov V. A., a famous Fedoskino artist, also known as a gifted Russian landscape painter has designed and then h..
School: Fedoskino Artist: Kuznetsov Size (inches): 5.75 diameter The most favorite Russian winter entertainment is featured on this Fedoskino lacquer box – riding sleigh horsed by three cl..
School: Fedoskino, 1991 Artist: Burbysheva Size (inches): 3.25x4.125x1.825 A famous Russian artist Burbysheva from the village of Fedoskino has painted this festive lacquer box according t..